The future is never what we expect it to be. 2015 is a few months away and self-lacing shoes are nowhere to be seen (although apparently being worked on). We don’t have flying cars or HUVr boards. It sure as hell doesn’t look like a scene from a Tom Cruise flick outside. While we continue evolving and making extraordinary strides, life still seems pretty ordinary, albeit moving much faster than before. My favorite footwear designs remain and will probably forever be immortalized in the ’90s, where just about everything was grandiose, in a good way. Colors, lines and patterns were exaggerated and bold, full of life without conformity. I remember when the Air Penny II dropped. My mind was blown. 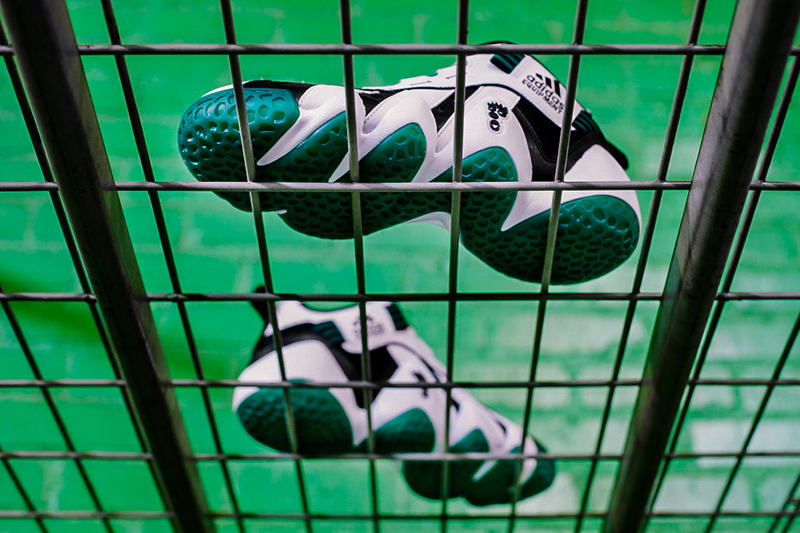 adidas kindly sent over their latest retro release the other day, a remake of the classic Key Trainer from ’96 and it brought me back to my days on the concrete schoolyard, hooping in turf trainers as a sixth grader. Back then I usually only got one pair of shoes per school year and by the end of it, they’d be demolished. Those were my church kicks, my everyday beaters and even my class picture joints. Above all, I remember how every release had a fearless attitude about it. Quite honestly I don’t really know if the emphasis was more on design or performance innovation, but at the time, comfort wasn’t really my main concern, it was more about how cool they looked. The Key Trainer made use of adidas’s Feet You Wear technology, which was also implemented in early Kobe signatures and was a strong element of the brand’s Equipment campaign. The thought process behind Feet You Wear was to create outsoles with rounded edges that conformed to a foot’s actual shape, hence providing improved stability and comfort. adidas was ahead of its time with this one and while not as fine-tuned as we are today with shoes that conform to the foot, its cool to look back and see how they foreshadowed the future of footwear.